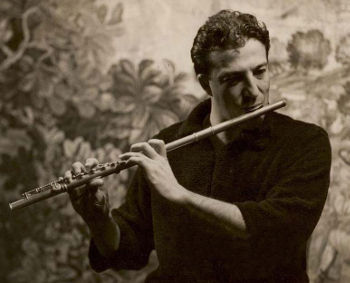 As a flutist, Claude Monteux, one of the last great flutists of the Golden Era, played under the batons of Toscanini, Walter, Beecham, Stokowski, Casals, Stravinsky, and his father Pierre Monteux. Mr. Monteux studied flute with Georges Laurent, then principal flutist of the Boston Symphony and conducting with his father, both privately and at the Monteux School for conductors. He appeared in concert and in recording with orchestras throughout the world, including the London Symphony, the Royal Philharmonic, the Pittsburgh Symphony, the NBC Symphony, and the Metropolitan Opera orchestra. Claude Monteux recorded extensively on London, Phillips and other labels, including concerti by Mozart and Bach with the Academy of St. Martin-in-the-Fields. As flutist and teacher, Mr. Monteux served on the faculties of the New England Conservatory of Music, the Peabody Conservatory, Vassar College and Ohio State University. He was known for his beautiful tone reminiscent of the style promulgated by the students and teachers of the Paris Conservatoire going back to Taffanel. He reminded his students often to "play with love". His teaching motto was, "Be honest to the music and the composer. Performance is truly about the music, not the player." He also said, "Above all else, they (students) should learn to be completely honest in their interpretations. This means developing independent interpretations rather than copying those of other artists. Music should never be distorted to make an effect." On the podium he served as Music Director of the Columbus Symphony (1953-56) and the Hudson Valley Philharmonic (1959-75). He guest-conducted orchestras in Berlin, Paris, Brussels, Norway and Holland. Claude Monteux died on February 22, 2013. To learn about Mr. Monteux visit www.magikflute.com/claudemonteux.htm.